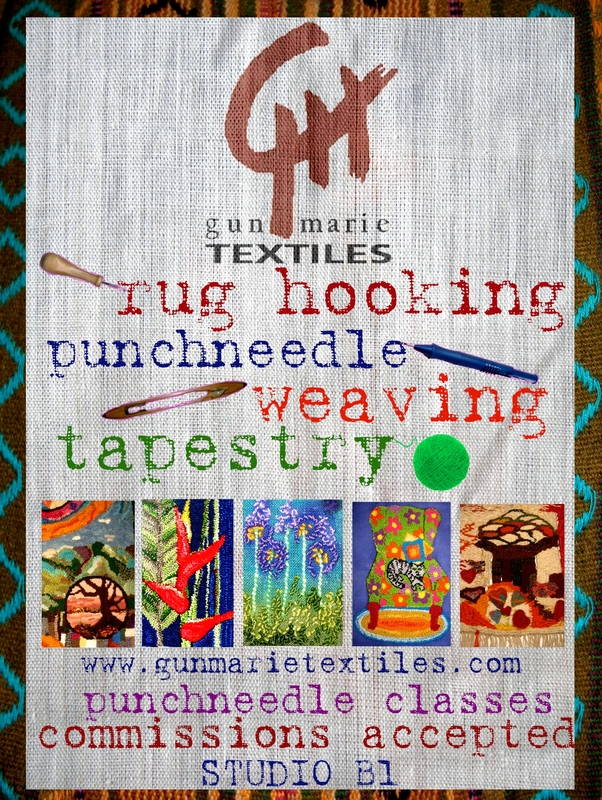 This is the list of my PUNCHNEEDLE classes. Please choose which one you want to do, and write to me to gunmarienalsen@hotmail.com telling me the days you are available for the class. During the week the classes are better from 6pm on, and on weekends anytime during the day. The duration of the class is 3 hours. Hope to hear from you and enjoy punching! Come and punch a bird in different colors and shapes, with a beautiful background. It is a great beginners class. The class fee will provide instruction, handouts, a pattern on a linen foundation and the floss needed to complete the project. You can purchase a Cameo needle and frames/hoops at the class or bring your own. Please bring a sharp scissors. Make a beautiful flower to decorate your room, your purse, a pillow, a card. Choose from three different patterns, use embroidery floss and a special needle to make beautiful gifts. The class fee will provide instruction, handouts, a pattern on a linen foundation and the floss needed to complete the project. You can purchase a Cameo needle and frames/hoops at the class or bring your own. Please bring a sharp scissors. Create a new picture to decorate your childs room. Choose from different patterns: hens, birds, snails, apples, using cotton floss and linen base to create a beautiful picture .The class fee will provide instruction, handouts, a pattern on a linen foundation and the floss needed to complete the project. You can purchase a Cameo needle and frames/hoops at the class or bring your own. Please bring a sharp scissors. Punch a fish in the sea! Choose between three designs and make a beautiful creation. The class fee will provide instruction, handouts, a pattern on a linen foundation and the floss needed to complete the project. You can purchase a Cameo needle and frames/hoops at the class or bring your own. Please bring a sharp scissors. This intermediate level class will include your choice of three butterflies patterns. You will have the chance to create the background of your picture. Finishing, framing and boarders will be discussed to make this project unique. The class fee will provide instruction, handouts, a pattern on a linen foundation and the floss needed to complete the project. You can purchase a Cameo needle and frames/hoops at the class or bring your own. Please bring a sharp scissors. Great beginners class for punch needle yarn! Create two coasters or one trivet, with punching yarn with the Oxford needle, choice of designs will be provided. The class fee will provide instruction, handouts, a pattern on a linen foundation and the yarn needed to complete the project. You can purchase the Oxford needle and frames/hoops at the class or bring your own. Please bring a sharp scissors. This intermediate level class will include your choice of three cat patterns. You will have a chance to use your creativity in color planning and shading the cat and the background. Finishing, framing, and boarders will be discussed to make this project unique. The class fee will provide instruction, handouts, a pattern on a linen foundation and the floss needed to complete the project. You can purchase a Cameo needle and frames/hoops at the class or bring your own. Please bring a sharp scissors. Give to your beloved a card decorated in punchneedle! Learn how to make a punchneedle Valentine’s Day card or put it on a small canvas and decorate it! The class fee will provide instruction, linen as a foundation and the basic floss that you need to complete the project. You can purchase a Cameo needle and hoops at the class or bring your own. Please bring sharp scissors. Learn how make an ATC (2.5”x3.5”) decorating it in punchneedle, to exchange with your friends! A fun way of learning how to punch! The class fee will provide instruction, linen as a foundation and the basic floss that you need to complete the project. You can purchase a Cameo needle and hoops at the class or bring your own. Please bring sharp scissors. Draw a simple landscape: seashore, mountains, a house with a tree, and punch it to be a beautiful piece to be framed as a gift. This is an intermediate level class, where you can develop your creativity. Finishing, framing and borders will be discussed to make this project unique. The class fee will provide instruction, linen as a foundation and the basic floss that you need to complete the project. You can purchase a Cameo needle and hoops at the class or bring your own. Please bring sharp scissors..
Come and punch a bunny for Easter! You can choose between three different patterns and three different dates. Create a beautiful background, frame it, make a card, or put on a purse. The class fee will provide instruction, handouts, a pattern on weavers cloth foundation and the floss needed to complete the project. You can purchase a Cameo needle and frames/hoops at the class or bring your own. Please bring a sharp scissors. Come and punch a beautiful fall project. A basic level class will include your choice of three different patterns. You will have a chance to use your creativity in color planning the background. The class fee will provide instruction, handouts, a pattern on a linen foundation and the floss needed to complete the project. You can purchase a Cameo needle and frames/hoops at the class or bring your own. Please bring a sharp scissors. This is an intermediate level class. Choose between two different patterns to punch beautiful Christmas candles. The class will provide instructions, handouts, a pattern on a linen foundation and the floss needed to complete the project. You can purchase a Cameo needle and frames/hoops at the class or bring your own. Please bring sharp scissors. Enjoy punching a snowman for your Christmas decorations! This basic level class will include your choice of three different patterns. You will have a chance to use your creativity in color planning the background. The class fee will provide instructions, handouts, a pattern on a linen foundation and the floss needed to complete the project. You can purchase a Cameo needle and frames/hoops at the class or bring your own. Please bring a sharp scissors. Make a Christmas tree to decorate a card or frame as a picture. This basic level class will include your choice of three different patterns. You will have the chance of using your creativity in color planning the background. The class fee will provide instruction, handouts, a pattern on a linen foundation and the floss needed to complete the project. You can purchase a Cameo needle and frames/hoops at the class or bring your own. Please bring sharp scissors.